Castlebar Golf Club completed a £900,000 course development plan under the watchful eye of Peter McEvoy. 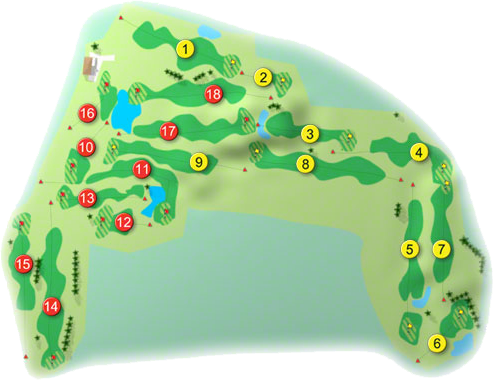 The course measures 5,877 metres Par 71 with a standard scratch of 71 off the back tees. Set in mature parkland the greens and course are always in the best of condition. Its feature hole is 145 metres Par 3, 16th. 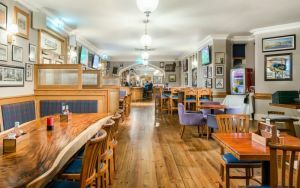 Castlebar has a fine stat-of-the-art clubhouse offering the golfer everything he/she could require. 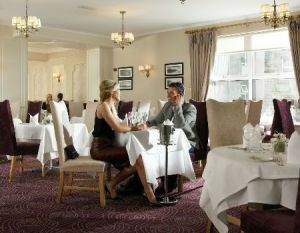 The members are renowned for the friendly welcome they extend to visitors to this very fine course. 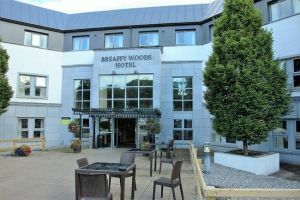 3-Rounds of Golf incl Castlebar, Ballinrobe and Westport, Whiskey Tasting, Tea, Coffee and Scones on Arrival, Live Music on One Evening, 4 Nights Bed and Breakfast, 4 Evening Meals incl Gala Dinner Banquet at 19th Hole on Final Night, Unlimited Tea and Coffee throughout your stay, Transfers from Train or Bus Station (must be pre-booked), No Single Supplement, Complimentary use of the Leisure Facilities onsite, Complimentary Wifi, Complimentary Car Parking. 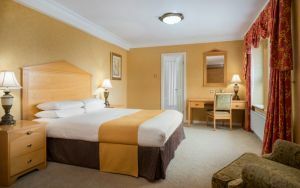 From: €559 total stay. There may have been no Sam or Brendan Martin Cup in Mayo yet again in 2017 but Castlebar Golf Club did the County proud when capturing the All-Ireland Jimmy Bruen Shield on 23rd September 2017. They beat Athenry Golf Club by 3½-matches to 1 ½-matches in the Connaught Final at Galway Bay Golf Club on Saturday 12th August. They were led out by Mick Kilcourse with Tommy Lawless who lost their match against David Flaherty with Mark Shivnan by 2 and 1, next on the tee were Kieran Horkan with Colin Dawson who beat Bob Reilly with Paul Kavanagh by 1-hole, they were followed by Shane Quigley with Johan Collins who had another close one when they had a 1-hole win over John Whelan with Oisin O’Connell, in the penultimate match Tommy Moylette with Mark Corrigan recorded a halve when called-in against James O’Connor with Kevin Greally, in the bottom match Shane Rice with David Walsh had a 3 and 2 win over Ian Kelly with Paul Molloy and a place in the All-Ireland deciders. They made their way to Carton House Golf in Co. Kildare where they drew Munster Champions Ballykisteen Golf Club in the All-Ireland Semi-Final on Friday 22th of September and recorded a 3-matches to 2-matches win over the Tipperary Club. Shane Rice with Tommy Lawless led them out and recorded a 4 and 3 loss against Olly Hodges with P. J. Caarey, they were followed by Shane Quigley with Johan Collins who lost their match by 1-hole against David Cartlidge with Sean Calvert, nex on the tee was Paddy Burke with Ray Prendergast who recorded a very comfortable 5 and 3 win over Liam and Gavan Downey, in the penultimate match Tom Moylett with Mark Corrigan had to go up the 19th before securing the point against Alan Murphy with Denis O’Brien, the bottom match Kieran Horkan with Colin Dawson recorded a 2 and 1 win over Mick Kennedy with James Nolan and a place in the All-Ireland Final against Ulster Champions Warrenpoint on the Saturday. They were led out this time by Shane Quigley with Johan Collins who lost out by 1-hole against Rian Carvvill with John Murray, next on the tee were Kieran Horkan with Colin Dawson had a 3 and 2 win over Gerard Durkin with Shane Carr, they were followed by Michael Kilcourse with Dave Walsh who went down to Hudson McGuffin with Barry Laverty by 2 and 1, in the penultimate match Tom Moylett together with Mark Corrigan again went up the 19th before securing the point, then in the bottom match Paddy Burke with Ray Prendergast secured the All-Ireland Green Pennant when they had a 2-hole win over Raymond Duffin with Eamon Rooney. The team Captain Was John Kelly Vice-Captain was Declan Prendergast. The reserves were Tommy Lawless, Shane Rice, Declan Prendergast and Ian Brennan. Well done to Castlebar Golf Club who kept their nerve throughout the Championship to secure their All-Ireland, maybe they could teach their Footballers how to get over the line!! The Ladies of Castlebar Golf Club were runners-up in the All-Ireland Junior Foursomes at Dundalk Golf Club when they lost to Munster Champions Tramore by 2½ matches to ½ match on Saturday 24th September 2016. They were led out by Ann Gallagher with Marian Martyn who lost out to Mia Maughan with Colette Palmer by 3 and 2, they were followed by Breda Gilvarry with Regina Kerr who recorded a halve against Lucia Ahearn O’Flaherty with Sarah Howard, in the bottom match Margaret Tighe with Bernie Burke lost to Mary Cantwell with Rachel Mulcahy by 3and 1. They played Leinster Champions Stackstown Golf Club in the Semi-Final on the Friday and recorded 2-matches to 1-match against the ladies of Padraig Harrington’s club. They were led out by Derval Molloy with Margaret Tighe who lost out to Anne O'Connor with Jean Constant by 5 and 4 next on the tee was Ann Gallagher with Marian Martyn who had a comfortable 6 and 4 win over Veronica Clarke with Rebecca Rush, in the bottom match Breda Gilvarry with Regina Kerr beat Avila Mairtin with Joan Moore by 5 and 4. Castlebar Golf Club won the Connacht Final of the Pierce Purcell Shield when they beat Gort Golf Club by 3-matches to 2-matches at Ballinrobe Golf Club on Sunday 7th August 2016. They made their way to Carton House Golf Club to compete in the All-Ireland deciders where they drew Leinster Champions Castlecomer in the All-Ireland Semi-Final on Thursday 15th September and recorded a 3-matcheses to 2-matches win over the Kilkenny team. First on the tee was Pat Waldron with Paul Doyle who lost out to Paul Walsh with Nicky Walsh by 2 and 1, they were followed by Stephen Munnelly with Thomas Ruane who went up the 19th before putting the first points on the board against Pat Comerford with John Bergin, next on the tee were David Molloy with Paul Fitzgerald who beat Noel Rothwell with Ken Hovenden by 4 and 2, in the penultimate match Sean Haugh with Declan Prendergast lost out to Ronan Ryan with Michael Daly by 2 and 1, with a place in the All-Ireland decider depending on the bottom match Val Jennings with Michael McHugh recorded a 4 and 2 win over Barry Doyle with Fergus O'Neill. They met Munster Champions Nenagh Golf Club in the All-Ireland Final on the Friday, Nenagh had had a very comfortable 4-matches to 1-match against Nuremore Golf Club on the Thursday Semi-Final. They were led out by Pat Waldron with Michael Heneghan who lost out to Patrick Kennedy with Padraig Hackett by 5 and 4, they were followed by Stephen Munnelly with Thomas Ruane who had a similar result against Bernard Hackett with Pat J. Hogan, next up was David Molloy with Paul Fitzgerald who recorded a halve against Mel Gleeson with John Hogan, in the penultimate match of Sean Haugh with Declan Prendergast was also recorded as a halve against Thomas Slattery with Jim Gleeson in the bottom match Val Jennings with Michael McHugh went down to David Hickey with Matthew O’Gara by 5 and 4. It would have been nice to see an All-Ireland go to Mayo as a Dub I sure didn’t want to see Sam go to Mayo even if it’s been 1951 since they last saw him!! Castlebar Golf Club won the Connaught Final of the Jimmy Bruen Shield at Gort Golf Club on Sunday 9th August 2015. They beat Strandhill Golf Club in the Semi-Final by 4-matches to 1-match and accounted for Galway Bay Golf Club in the decider by 3½-matches to 1½-matches. They were led out by Paddy Burke & with David Walsh who lost their match on the 19th against Tom Molloy with James Clasby, they were followed by Tommy Moylett with Ian Brennan who beat Liam Grealy with R. Downes by 1-hole, next on the tee were Kieran Horkan with John Collins who went to the 18th before clinching the point against Damian Coleman with Michael Scanlon, in the penultimate match Michael Kilcourse with Shane Rice beat Jack Tuohy with Jimmy Moran by 4 and 2, the bottom match of Ryan O'Malley with Ray Prendergast was recorded as a halve against Keith Harte with Marcus Brennan when called in. They made their way to Carton House to compete in the All-Ireland Finals on 18th September, where they were drawn against Leinster Champions Greystones Golf Club in the All-Ireland Semi-Final. Tom Moylett with Ian Brennan led them out against Con Thomas with Jack Joyce and put the first win on the board with a 3 and 1 win, they were followed by Paddy Burke with Dave Walsh who had a comfortable 5 and 3 win over Paul Keane with Ben Hynes, next on the tee were Kieran Horkan with Johan Collins who lost their match against Keith Lewis with Pete Murray by 7 and 5, in the penultimate match John McHugh with Gary Corbett beat Gavin McGirr with Ray McDonnell by 5 and 4, the bottom match of Michael Kilcourse with Shane Rice against Eugene Strong with Cian Gilmore was recorded as a halve. They met Munster Champions Ballybunion Golf Club the following morning in the All-Ireland Final, Ballybunion had accounted for Ulster Champions Fortwilliam Golf Club by 4-matches to 1-match in their Semi-Final the previous day. They were once again led out by Tom Moylett with Ian Brennan who had a very comfortable 5 and 4 win over James Lavery with Paul Enright, they were followed by John McHugh with Gary Corbett who lost their match against Ronan Cross with Finbarr Carrig by 4 and 2,, next up were Paddy Burke with David Walsh who went down by 5 and 4 to Mark Dilger with Iarla O'Mahony, in the penultimate match Ryan O'Malley with Mark Jennings halved their match against Padraig Quill with John Eggleston, in the bottom match Mick Kilcourse with Shane Rice lost their match against Adrian Walsh with Brian Slattery by 4 and 3. Other members of the team were Kiwi Horkan, Johan Collins and Colin Dawson they were Captained by Shane Quigley. Castlebar Golf Club won the Connacht Final of the Pierce Purcell Shield at Westport Golf Club in August 2008. They made the long journey to Monkstown Golf Club to try and record the clubs second green pennant in the long history of the club. The were drawn against Munster Champions Limerick Golf Club in the All-Ireland Semi-Final on Thursday 18th September 2008. First on the tee was Padraic Rice with T. J. Prendergast who lost out by the narrowest of margins against John Reilly with Declan Barriscale. Next up was John McHale with Michael Grennan who had one of those days when loosing out to Eamonn Grimes with Eamonn Kirby by 7 and 6. The were followed by Colin Dawson with David Molloy who had a very convincing 5 and 3 win over Michael Ahern with Michael Ryan. The penultimate match of Michael McGing with James Jennings against Joe Kemmy with Denis Ryan saw the match go Limerick’s way by 6 and 4. The bottom match of Charlie Muldoon with Des Carey against John Gleeson with Gerard Gleeson again went to the Munster Champions way by 6 and 5. So it was not to be for Castlebar Golf Club in 2008, however they did have the consolation in the knowledge that Limerick went on to beat Warrenpoint the reigning All-Ireland Champions in the final the following morning. Castlebar Golf Club won the Connacht Final of the Irish Junior Cup in 2007, and they made the long journey to Shandon Park Golf Club in Belfast to compete in the All-Ireland Semi-Final on Wednesday 12th September. They were drawn against Ulster Champions Belvoir Park, first on the tee was Eoin Lisibach who won his match by 1-hole against Ian Browne, he was followed by Stephen Munnelly who lost out to Martin Kelly by 2 and 1. Next up was David Haugh against Declan O'Hara who lost by 3 and 2. The penultimate match saw Brendan Frost lose to Alan McMillen by 3 and 2. Padraic Hurst played anchor against Mick Malone but it was not to be Padraic’s day as he lost by 6 and 5. 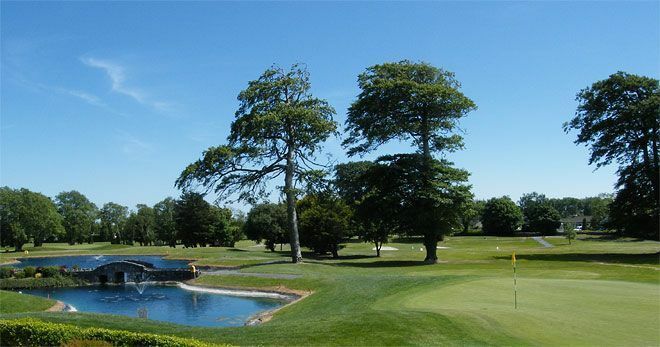 A 4 matches to 1 match victory was recorded to put Belvoir Park through to the All-Ireland Final against Munster Champions Muskerry Golf Club, the eventual winners on the Thursday. Castlebar Golf Club won the Connacht Final of the Irish Junior Foursomes and were drawn against Ulster Champions Roe Park in the All-Ireland Semi-Finals at Lucan Golf Club on 18th August 2003. The team on the day was, Robin Daly with John McHugh and Ian McDonagh with Brian Cormack. The Ladies of Castlebar Golf Club won the County Cup in 2003, when the team was, Marie Rowley, Anne Horkan, Lorna McCurdy, Sheila Baynes, Regina Kerr, Karen Moylett and Connie White. Castlebar won the Mayo County Cup after a lapse of nine years with a score of 207. The team was Pat Griffin, Jimmy Broderick, Chris Casey, Padraic Connolly, Jim McGovern, Joseph Stephen Munnelly and Pat Staunton. Castlebar Golf Club won the All-Ireland Irish Junior Foursomes in 1993, the team was Paul O'Hara, Michael Kilcourse, Barry McGovern, David Barney, Shane Quigley. Castlebar won the Connacht Barton Shield in 1993 and were bronze medallists at Woodbrook Golf Club, when the team was, Stephen Munnelly, Paul Benson, John Langan, Joe Langan and A. C. Hiney, they were managed by Frank Walsh. They won the Connacht Shield in 1998, 1994, 1993, 1972 and 1968. They won Connacht Inter Club in 1996 and 1994. The Connacht Cecil Ewing Shield in 1993 and 1992. The Connacht Irish Schools in 1993. The Ladies of Castlebar Golf Club won the County Cup in 1993, when the team was, Anne McGovern, Eileen O'Boyle, Maureen Tobin, Teresa Reddington, Sheila Baynes and Carmel Heneghan. 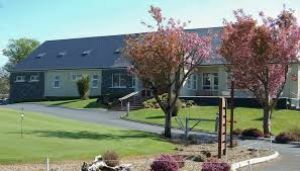 The Ladies of Castlebar Golf Club won the Western District Intermediate Team Event in 1990, when the team was, Maureen Tobin, Debbie Jennings, Mary McDonald, Eileen O'Boyle and Patsy Connor. Castlebar Boys' won the Connacht Junior Inter-Club Matchplay in 1988, when the team was, Michael Langan, J. Langan, B. Munnelly, D. Kelly, D. Connolly and R. Campbell. Details of the origins of the club are given in the 75th anniversary brochure produced by Mr. John Egan, a member of the club for 55 years. It reads "The initial meeting to form the club was held in November, 1910, in the Imperial Hotel, Castlebar. Chairman of the inaugural meeting was Rev. A. Lendrum and 32 other local gentlemen. Lord Bingham was elected first President. The initial course was at Flannelly’s of Moreen until it moved to the present course at Rocklands, shortly afterwards. Credit is given to members of the Connaught Rangers, who were stationed in the town at the time, for helping to start the club. There was a rifle-range on the course at the time, which was used by the local military personnel. In 1958, extra land was purchased, known as Rockland House. In 1982, further land was acquired which allowed for an 18-hole course to be opened in 1984. It is clear there was an early interest in golf in Castlebar, as early as 1898, The Irish Times reported a match with a number of golfers from the town and members of Ballinrobe Golf Club. On occasions he'd mark his ball with a beer can and ask an attractive woman in the gallery to recommend to him a good measure".